There was no better way to introduce Philip than by quoting his definition of art. 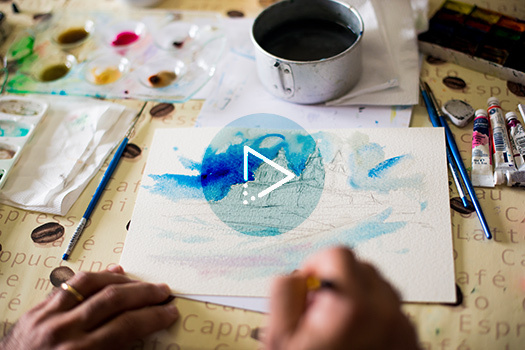 For this artist, art is something very much alive. It has grown up with him, from the very first days of conjuring images out of thin air till today. This is not to say that the road has been an easy one. Mastery of art did not come fluently at first and Philip was tempted several times to back out and opt for other interests which had quipped his attention such as the guitar and photography. However, he persisted in the face of challenges and today he is able to reap his hard-earned rewards. Philip might recall the early days when he first touched pen to paper, but he cannot imagine the day when the pleasure he takes in drawing is absent. This is probably because, for Philip, art is expression – and communication is vital to understand what is happening around us. 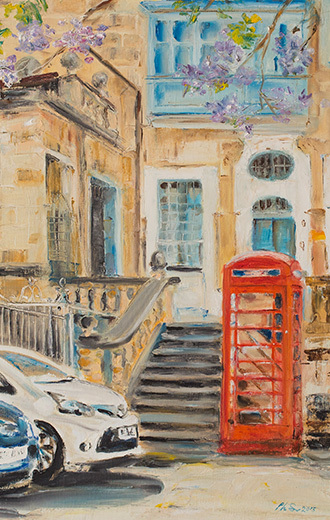 In a painting the artist can communicate and send messages simply through a change in colour, a shift in perspective or the different placement of an object. Today, his favourite medium is without a doubt watercolour. According to Philip, the way colours take on a life of their own as soon as water touches them and the way they seem to attempt escape as they rush, uncontrollably, across paper gives a certain empowering quality to the drawing. Almost as if it is painting itself. It’s a hurried method, complying perhaps, with a hurried lifestyle. 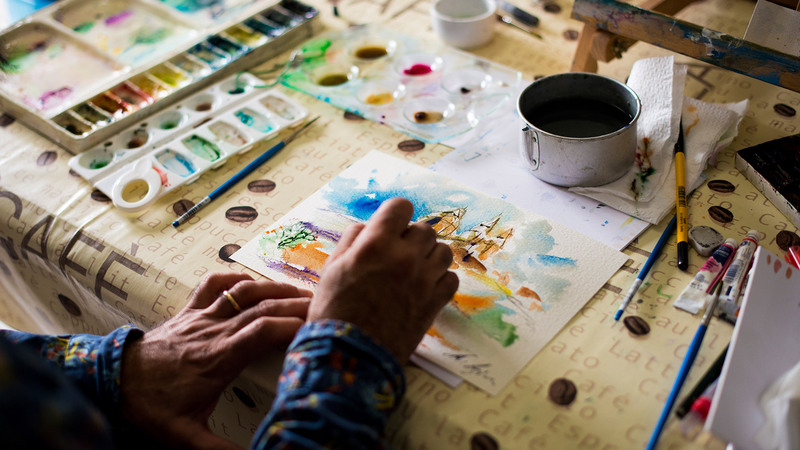 Oil paint is also a favourite with Philip who modestly admits he has seen good results when he dedicates his entire focus on the task at hand. 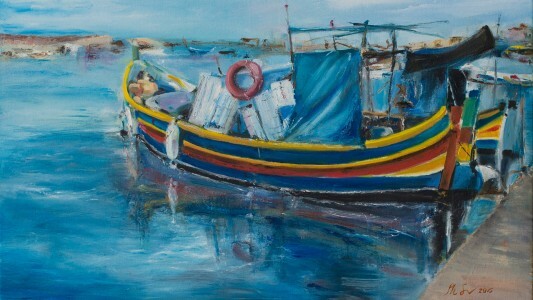 Philip muses about the importance of depicting the Maltese way of life. 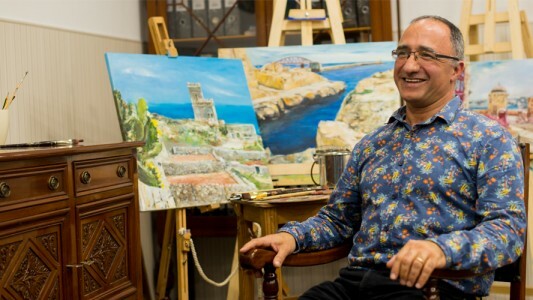 He encourages Maltese artists, whom he describes as being hard working due to the highly competitive scene, to scrutinize Malta and the Maltese. 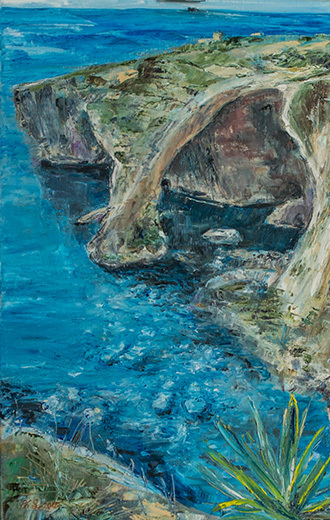 His passion for the Maltese way of life is evident in the rapid-fire succession of the questions he asks other artists: Who is the Maltese man? What does he look like? How does he act? What does he do? He prods artists on, to think outside the box, to depict sounds, themes and scenes; the Maltese housewife baking a pie or a Maltese baker. He is almost urgent in his insistence because, he claims, these details risk becoming extinct. The same goes for other Maltese traditions. Capture them, he says, exhibit them – make them immortal. This is what Maltese artists should be focusing more on. Philip’s eyes lose some of their focus when he talks of new experiments he’s yearning to try out. A theme he dubs “velocity” is often on his mind. By velocity, Philip refers to the transformative nature of art when one is able to depict different senses blurring into one another. This intertwining of senses starts off from an object which is clearly depicted but which also hints at other feelings: pain, emotions, smells and sounds. Rather than a dream, Philip prefers to call it an experiment – achievable and real. Some of Philip’s best work of arts happen in a total state of abandon. He may unknowingly use undue physical force, pushing the frame he is working on down and further down, until he realises that he has to bend over to paint, at which point he’d stop to put it back up. Or, he remembers fondly, when he wonce worked late at night, pushing himself until the drawing suddenly started taking a beautiful shape with the rising of the sun outside. When it was done he went to rest, only to wake up and marvel at what he had managed to accomplish. 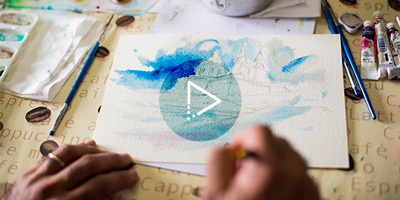 Philip talks about how he finds a connection with art in small episodes – like trying to control a water spill and the colours are racing ahead of him, almost as if they are trying to take control of the painting. When art manages to move a person or change his temper, to the point that he or she is begging to buy the drawing, that is particular feeling is something beyond words. Unfortunately, he warns, the secret to art is to not fall in love with it. When you do, you don’t want to part from it or sell it, and when this recurs, you will stop painting, consumed as you are with what you already have. This however is a challenge for any artist in love with what he or she does. Work and work and work harder with tooth and nail because it is not easy. Art can be an elusive mistress, prone to flights of fancies. However, art is present everywhere. “Children tell me they want to become artists,” Philip says with a half smile and open hands. “I tell them they already are. They just need to work at it, constantly.” Just as no man is an island, so does an artist struggle without good mentors. Speaking from personal experience, Philip admits that powerful artists are hard to come by but when they are found, they are a veritable treasure. One can only be a good artist through criticism. Let them criticise you. For it is only through constructive criticism that you can keep treading on the path of success.